The Peary-MacMillan Arctic Museum celebrated the opening of its new exhibit, “Spirits of Land, Air, and Water: Antler Carvings from the Robert and Judith Toll Collection,” Wednesday night with a lecture by Norman Vorano, curator of contemporary Inuit art at the Canadian Museum of Civilization in Quebec. The Tolls, Inuit art enthusiasts from California, are in the process of donating their entire collection to the Arctic Museum. Vorano stressed that now is a particularly crucial time to be examining works from the far north. “Inuit artists are breaking with restrictive conventions of the past and entering into an increasingly globalized, modern world,” he said. Vorano’s Wednesday lecture was more or less a survey of 20th-century Inuit art, focusing on how material creates meaning in a work. He discussed how Canadian artists sculpt with types of stone unique to their regions as part of both an aesthetic competition and a quest for individual expression. “Artists invest a great deal of symbolism in the types of stone used in carving,” he said. While Vorano spoke mainly about works made from stone, the new exhibit celebrates another material: caribou antler. While sifting through the contents of the Tolls’ latest donation, LeMoine said she was amazed by how many pieces were made from antler. One of the reasons that stone sculpture is more common in the north is because it is widely considered to yield more possibilities in shape and form. Antlers, in contrast, appear somewhat restrictive at first glance; all are a somewhat similar shape and size, with little material to work with. However, LeMoine said she sees them as limitless templates for creative expression. For LeMoine, one of the most striking aspects of the sculptures on view is their duality of expression. 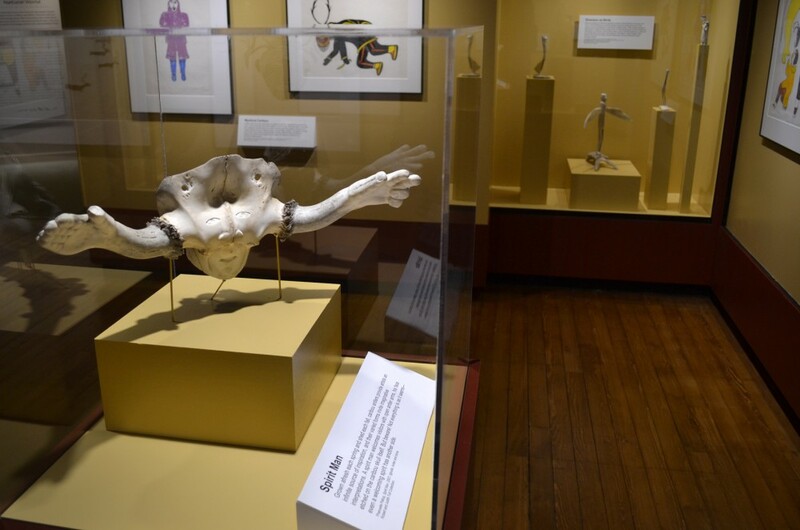 One such work, made from a pair of antlers joined by a partial skull, smiles at visitors as they enter the exhibit; however, the other side of the sculpture depicts a frightening face with a gaping mouth. “He’s a complex guy,” said LeMoine with a chuckle. The exhibit also features various prints—primarily stonecut—that illustrate the importance of caribou in traditional and contemporary Inuit culture as both a source of food and as a useful material. LeMoine said she is confident that the exhibit will be a success. EDITOR’S NOTE: Longtime Orient adviser Sandy Polster died yesterday at his New York home after battling cancer for more than two years. Bill Wheatley, a close friend of Sandy’s and former executive vice president of NBC News, notified friends of Sandy’s death in an email yesterday evening to which the following obituary was attached. “As you know, Sandy loved to write. Accordingly, he composed his own obituary, which he asked be sent to you,” Wheatley wrote. Sandy advised The Orient for 12 years, presiding over a marked increase in the professionalism of the paper. Which is not to say that he was satisfied: “One hundred percent of The Orient is 40 percent overwritten,” he once said. To a student body with a four-year memory, his perspective was invaluable. He is missed, but his guidance steers us still. WRITER’S NOTE: Greetings from the beyond, wherever it is. While death is life’s only certainty, most don’t know the when and how. I did, and I decided it would be fun if my final writing assignment were my own obituary. —s. Sandor M. Polster, who worked closely with Walter Cronkite, Dan Rather and Tom Brokaw as writer and news editor in the 1970s and 1980s, died on March 21 at his apartment in New York. He was 71. The cause was complications from gastric cancer, which he had battled for more than two years. Sitting at 495 career wins, Coach Terry Meagher has ended only three seasons with a losing record. There are very few people who need no introduction, but Men’s Hockey Coach Terry Meagher is certainly of them, at least on this campus. In his 30th season, Meagher has won an astounding 495 games, 22nd all time among coaches in the history of men’s collegiate ice hockey. Over the course of his tenure, he has consistently attracted talent to Brunswick and deployed innovative strategies for sealing wins. This year is no different for Meagher, as men’s ice hockey now has the most wins since the 1988-1989 season, and was ranked as high as second in the nation. The team is currently the No. 1 seed in the NESCAC championship, and will face Middlebury this Saturday. But Meagher is more than just a coach, and his 30 years at Bowdoin add up to more than just a successful career. Students cite his easy-going attitude and intense pride for anything Bowdoin-related as reasons behind his significant influence in the lives of generations of students, even those outside of the hockey program. Born and raised in the blue-collar town of Belleville, Ontario, Meagher is one of nine children. Like many of his siblings, Meagher grew up on the pond.